The Second Plenary Meeting of the 7th Central Committee of the Workers’ Party of Korea was held in Pyongyang on October 7, Juche 106 (2017). Kim Jong Un, Chairman of the Workers’ Party of Korea, presided over the meeting. The plenum was attended by members and alternate members of the WPK Central Committee and members of the WPK Central Auditing Commission, with senior officials from the WPK Central Committee, ministries, national agencies and local governments at all levels and other officials from major industrial establishments present as observers. On the agenda were the immediate tasks to be tackled under the prevailing situation and the organizational issue. Delivering a report on the first agenda item,Kim Jong Un took stock of the complex international situation surrounding the DPRK and the pending issues before specifying present Party activities to cope with the situation, direction of economic development, and strategic tasks and ways in this regard. He said that the US imperialists are doing their utmost to strip the DPRK of its rights to sovereignty, existence and development by fabricating a series of “sanctions resolutions” in the UN Security Council in league with their followers. Our nuclear weapons are a priceless fruit of the Korean people’s painstaking efforts to protect their destiny and sovereignty from the long-standing nuclear threats of the US imperialists, he noted. And he also described them as a powerful deterrent that helps safeguard peace and security on the Korean peninsula and in other parts of Northeast Asia and that fully guarantees the Korean nation’s rights to sovereignty, existence and development. He added that such a deterrent serves as a treasure sword of justice with which to drive out the nuclear cloud of tyranny, likely to bring the worst catastrophe to mankind, and to ensure the people lead an independent, worthwhile life under a clear and blue skyHe appreciated that the country’s science and technology has made rapid progress this year, despite the ever-mounting sanctions by the US imperialists and their followers, facilitating the economic growth. Through this year’s efforts to carry out the decision of the Seventh Party Congress, he said, we have obtained such valuable experience that no matter what sanctions the enemies impose, we are able to shape our own future as our economic structure is based on self-reliance and solid foundations. He reaffirmed that the current situation and reality has proved the Party was quite right to decide to advance steadily along the road of Juche-based socialism, upholding the line of pushing economic construction and nuclear buildup simultaneously, and that it needs to stay the course unswervingly in the future. He set forth the Party’s principled stance and revolutionary counter strategy to roll back the US nuclear blackmail and strengthen the might of the independent national economy so as to make a breakthrough in the building of a socialist economic power. He stressed the need to build up the country’s capacity in such a way as to promote independence and self-reliance, and to thwart the enemy’s reckless nuclear war moves and vicious sanctions and pressure. He was hopeful that the Party would give full play to its proper leadership ability to settle accounts with the US over the decades-long showdown and bring earlier the victory of socialism, and illuminated the direction and tasks to bring about a fresh upsurge in the revolution. He stressed the need to further strengthen the might of single-minded unity between the Party and the masses of the people. Single-minded unity is the cornerstone of the existence of our Party and state and the most powerful weapon of our revolution, he said, adding that the Party and state should direct and subordinate all their activities to promoting single-mindedness among the revolutionary ranks and the Party should work harder to develop such a revolutionary trait of serving the people wholeheartedly. He pointed to the need to accomplish the historic cause of building the country’s nuclear capability by steadily implementing the Party’s “simultaneous-push” line. He said that a fresh turn should be brought about in the building of a socialist economic power with self-reliance and self-development as the driving force and on the strength of science and technology. 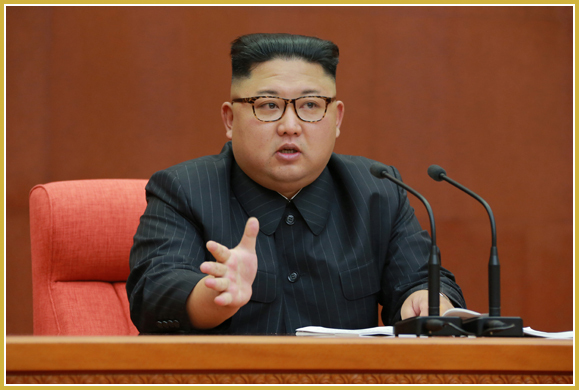 He referred to the need to bolster up self-reliance and the Juche character of the national economy, saying that self-reliance and the strength of science and technology are the key to foiling the flagrant sanctions and pressure by the US imperialists and their lackeys and turning adversity into fortune. It is important to make strenuous efforts to transform the national economy into one fully relying on local efforts, technology and resources, true to the line of making the economy Juche-based and the principle of self-reliance, so that the process of overcoming the current grave situation can lead to effecting a decisive turn in the building of a self-supporting economic power, he said as he detailed the tasks to be carried out by different economic sectors. Science and technology is the engine for the building of a socialist power, he noted, and all sectors and units should give priority to science and technology and tap the full potential of their sci-tech personnel and working employees in order to carry out the Party’s economic policies. The Cabinet and other economic guidance agencies should work out detailed plans to translate the revolutionary counter strategy into reality and oversee their implementation responsibly, he said. He set further enhancement of the militant functions and role of Party organizations at all levels as an important way to implement the revolutionary line and strategy of the Party. The whole Party should focus on strengthening primary Party organizations and Party cells so that all basic Party organizations would always work in a militant and dynamic fashion under the unified leadership of the Party Central Committee and seethe with activities to carry out the Party line and policies, he said. The current situation is grave and we are facing trials, but our Party has nothing to worry about as it enjoys absolute support and trust of all service personnel and people and will always emerge victorious, holding fast to the independent line in any upheavals, he noted. Our cause is invincible as we have the solid foundations of an independent economy provided by President Kim Il Sung and Chairman Kim Jong Il, an army of scientists trained by our Party, the army and people imbued with the revolutionary spirit of our Party and the fighting tradition of self-reliance, he said, calling on all of them to work hard to win the final victory of the revolution, united more closely behind the WPK Central Committee. The plenary meeting adopted a decision on the first agenda item. It discussed the organizational issue as the second agenda item. Members and alternate members of the Political Bureau of the WPK Central Committee were recalled and elected to fill vacancies. Pak Kwang Ho, Pak Thae Song, Thae Jong Su, An Jong Su and Ri Yong Ho were elected as members of the Political Bureau of the WPK Central Committee. Choe Hwi, Pak Thae Dok, Kim Yo Jong and Jong Kyong Thaek were elected as alternate members of the Political Bureau of the WPK Central Committee. Vice-chairmen of the WPK Central Committee were replaced. Pak Kwang Ho, Pak Thae Song, Thae Jong Su, Pak Thae Dok, An Jong Su and Choe Hwi were elected as vice-chairmen of the WPK Central Committee. Members of the WPK Central Military Commission were recalled and elected to fill vacancies. Choe Ryong Hae, Ri Pyong Chol, Jong Kyong Thaek and Jang Kil Song were elected as members of the WPK Central Military Commission. Members and alternate members of the WPK Central Committee were recalled and elected to fill vacancies. Kim Pyong Ho, Kim Myong Sik, Kim Jong Sik and Choe Tu Yong were promoted from alternate members to members of the WPK Central Committee. Ri Ju O, Jon Kwang Ho, Ko In Ho, Choe Tong Myong, Ryang Won Ho, Kim Kwang Hyok, Hong Yong Chil, Kim Myong Gil, Kim Tu Il, Ryang Jong Hun, Ri Hi Yong and Ho Chol Yong were elected as members of the WPK Central Committee. Sin Ryong Man, Yu Jin, Sin Yong Chol, Jang Kil Song, Ju Song Nam, Rim Kwang Ung, Jang Ryong Sik, Kim Yong Ho, Hyon Song Wol, Ma Won Chun, Ryom Chol Su, Song Chun Sop, Jang Jun Sang, Kim Yong Jae, Kim Chun Do, Kim Chang Gwang, Kim Yong Gyu, Jo Jun Mo, Sin Yong Chol, Kim Chang Yop, Jang Chun Sil, Pak Chol Min, Pak Mun Ho, Choe Sung Ryong, Choe Rak Hyon, Ho Pong Il, Kim Kwang Yong and Son Thae Chol were elected as alternate members of the WPK Central Committee. Some of department directors of the WPK Central Committee and editor-in-chief ofRodong Sinmun were appointed. Choe Ryong Hae, Pak Kwang Ho, Thae Jong Su, Kim Yong Su, Ryang Won Ho, Ju Yong Sik and Sin Ryong Man were named as department directors of the WPK Central Committee. Kim Pyong Ho was appointed as editor-in-chief of Rodong Sinmun. The chairman of the Inspection Commission of the WPK Central Committee was replaced with Jo Yon Jun. Kim Tu Il was nominated as chairman of the WPK South Phyongan Provincial Committee, Ryang Jong Hun that of the WPK North Hwanghae Provincial Committee and Ri Hi Yong that of the WPK North Hamgyong Provincial Committee. The Second Plenary Meeting of the 7th WPK Central Committee presided over byKim Jong Un will mark a turning point in hastening final victory in the building of a socialist power and the accomplishment of the revolutionary cause of Juche by dynamically mobilizing the whole Party, the entire army and all people in the general offensive to carry out the decision of the Seventh Party Congress under the unfurled banner of the great Kimilsungism-Kimjongilism..